← Unraveling My Childhood Asthma: Did Motherhood Cure It? 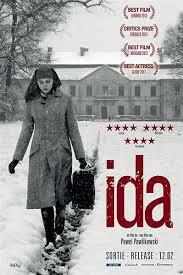 Set in 1962 Poland, “Ida” (played by Agata Trzebuchowska) is the story of an 18-year-old, orphaned, novitiate ready to take her vows when she learns from her Aunt Wanda (played by Agata Kulesza), her only living relative, that she is Jewish. Wanda is everything Anna, (her real name is Ida), isn’t. She’s a drinking, smoking, powerful former prosecutor, and a manizer—the impure to Anna’s pure. Together, this odd couple embarks on a journey to discover their family’s past in the Holocaust. Shot in black and white with extended long shots, the spare and reduced scenery has the effect of stripping away any distractions. We are left with a very clear view of the psychological battles each woman is waging as she comes to terms with her past. One wages externally and loudly; the other is quiet and contained. It is a haunting and heart-breaking tale and one that I will never forget. This entry was posted in Writing About the Arts. Bookmark the permalink.